Disc Records 78 rpm CALYPSO album with cover illustration by the legendary David Stone Martin (1913-1993), whose work adorns hundreds of 1940s and 1950s jazz, blues, folk, and ethnic records. In the early 1940s, the Chicago-born and -bred Martin befriended artist Ben Shahn, whose work proved inspirational. 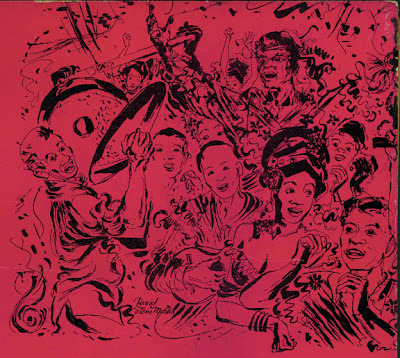 Martin got started in album cover design in 1944 when his friend, pianist Mary Lou Williams, persuaded her label to hire Martin to illustrate her next release. The company honcho, Moses Asch, was so impressed by Martin's virtuosity that he hired him as art director. In the 1950s, Martin's moody figure studies for Norgran, Clef, Verve, and Mercury practically defined the illustrated jazz LP cover (in a manner far different than, say, Jim Flora). Eric Kohler, who reprinted over a dozen classic Martin LPs in his book In The Groove: Vintage Record Graphics 1940-1960, observed: "Many of Martin's covers did not have an actual image of the recording artist, but rather an abstract image that might recall the feeling of the music." A book of his work, Jazz Graphics: David Stone Martin, was published in Japan in 1991. It is, sadly, out of print and hard to find. Martin's vital, cosmopolitan line art deserves renewed circulation. 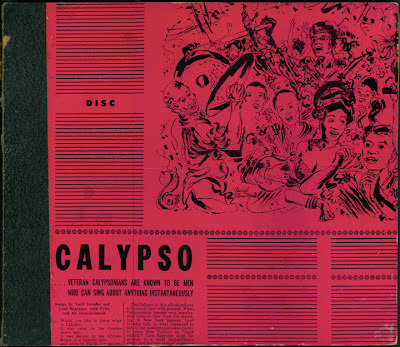 The calypso album above contains three sides by Lord Invader ("Tied-Tongue Baby," Yankee Dollar in Trinidad," and "New York Subway") and three by Lord Beginner ("Shake Around," "Nora, the War is Over," and "Always Marry a Pretty Woman"). On the 2007 Muriel's Treasure WFMU marathon CD, entitled More Bedbugs, there's an unlisted 26th bonus track. 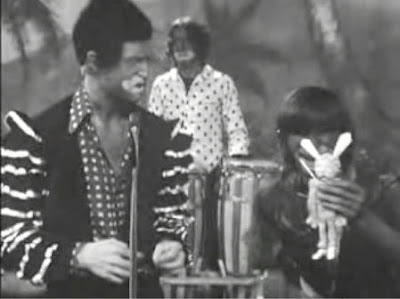 Several recipients of the compilation have inquired about the mystery calypso. This isn't a clue; it's the answer. Not the worst calypso ever, nor the funniest. Not the most improbable — The Muppets recorded "Pig Calypso" — but perhaps the most ethnically unhinged. All hail, Victor Anthony Stanshall.